Software giant Microsoft launches dozens of products and services every year. The company typically relies heavily on advertising and PR to get the word out. But for its Office 365 product, the team took a different approach. Using partnerships and social media, Microsoft connected specifically with women business owners – a key audience group. Rather than directing promotional messages toward them, Microsoft involved them in the process from start to finish. “It’s definitely innovation within a large matrix organization like Microsoft that hasn’t really done this in the past,” said Penny Delgadillo, senior product manager at Microsoft. In just a two-month period, the entirely social Office 365 “Your Office, Your Terms” campaign garnered 5.8 million overall campaign impressions and four times more traffic from social sharing than the typical Microsoft campaign. More than 62,000 fans follow the product on Facebook. The “Your Office, Your Terms” campaign brought in 5.8 million campaign impressions. With an active content calendar, the company landed 30 original stories in 60 days. The content mix was 80 percent women in business and 20 percent Microsoft authors. The campaign brought in more than four times the amount of traffic from social sharing than the average Microsoft campaign. 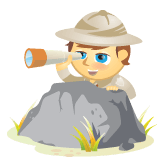 Over half of site visitors clicked Try/Buy. 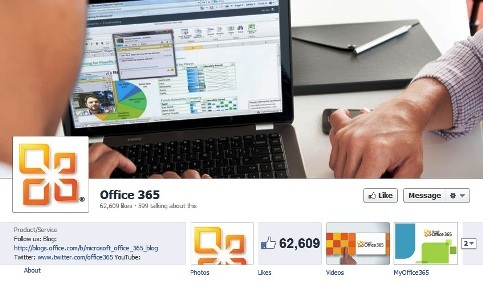 Launched in June 2011, Microsoft’s Office 365 product gives users web-based (cloud) access to email and calendars, Office web apps, web conferencing and file sharing. For this brand-new product, Microsoft targeted high-level female executives, entrepreneurs and small business owners. Ahead of the campaign, the team needed to understand what was on the minds of women in business. Microsoft decided to partner with 85 Broads, a nationwide network of women executives and business owners. With a regular blog for Forbes.com, the organization brought valuable connections and a high profile. “You have to choose organizations that are going to give you instant credibility,” Delgadillo said. Through 85 Broads, Microsoft conducted a survey of members around remote working and technology. 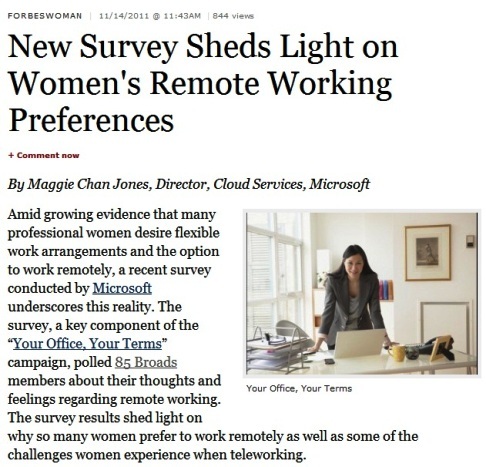 Microsoft's Maggie Chan Jones shared insight on women's remote working preferences on Forbes.com. Through the survey, Microsoft learned that remote working increases productivity and job satisfaction – giving the company some strong topics for conversation across its social networks. With insight from the survey, Microsoft built a high-volume editorial calendar with a content mix from 80 percent women in business and 20 percent Microsoft authors. The 85 Broads partnership helped open doors to collaborate with other women’s organizations and influencers such as Women 2.0, TechMamas and the National Council for Research on Women. “We have about 65 influential women bloggers across a variety of media. Whether they’re business owners themselves, whether thought leaders in their own marketplace, whether they’re presidents and owners of different organizations that help women-owned businesses, we cultivate these relationships and have them drive our social message and outreach,” Delgadillo said. With its Office 365 blog, Microsoft provided the platform for content and discussions, as well as facilitated guest post contributions for leading business publications. 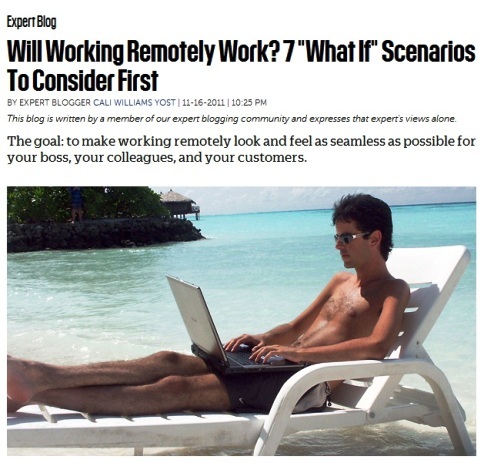 Fast Company expert blogger Cali Williams Yost wrote about remote work. The campaign also generated a number of posts on external blogs such as TechMamas and News on Women. Beth Blecherman wrote about remote work on her popular blog, TechMamas. With such an active content calendar, the company landed 30 original stories in 60 days. 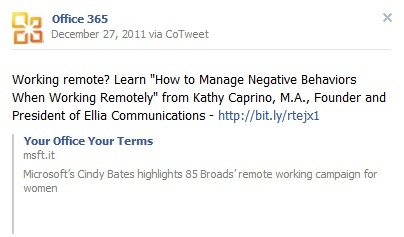 Microsoft teamed with respected women professionals for guest posts. The list of high-profile guest contributions included Forbes. 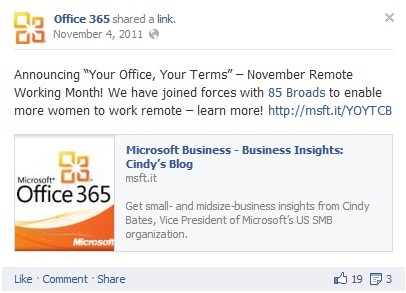 Microsoft used a hashtag (#YOYT) for the Your Office, Your Terms campaign. Expert tips truly engaged the target audience. So, how does in-demand content and “hyper-social” activity translate to people taking action – learning about the product and downloading a free trial? “We did a good amount of work in terms of, how do we make social turn into dollars and sense?” Delgadillo said. Rather than overtly pitch, Microsoft simply encouraged bloggers to talk about technology that enables remote working success and other best practices of women in business. At the bottom of articles and blog posts, readers could click links to learn more, download a free trial of the product or buy it. A friendly "call to action" in the TechMamas article. Sprinklr, an enterprise social CRM tool, helped the company evolve its conversation channels, workflows and queues, monitoring dashboards, reporting, audience and content management. The company enabled Meteor Solutions on all campaign pages and posts to allow tracking of percentage of visitors from social media, top conversion rates and many other important social sharing metrics. Simply Measuredallowed the company to aggregate social media data from across several networks and the web to ensure proper tracking on outgoing messages. Meteor Solutions was just one tool the "Your Office, Your Terms" team used to measure results. 45 percent of visitors to the product site were from social sharing, compared to 10 percent on average for Microsoft. The “Your Office, Your Terms” page was the most visited page on the Office 365 site in December (74 percent of all U.S. Office 365 page engagement). The campaign garnered a lower average cost for the company. “We effectively utilized audience marketing and the power of social to amplify our message organically to still meet the end result and not proactively spam the end user with try or buy messaging,” said Matthew Tennant, a social media consultant/manager for Microsoft. Know your audience – Before kickoff, Microsoft conducted a survey through the organization 85 Broads to understand the top issues and design content accordingly. Increase credibility with partnerships – Partnerships gave the company “instant credibility” with its target audience: women in business. Complement online with offline – Microsoft hosted live events at its own stores and through partner organizations to give women a chance to interact face to face. On average, events brought in more than 100 attendees, driving the funnel of demos, trials and purchases. Create win-win opportunities – By featuring guest bloggers on its site and others, Microsoft built its thought leadership and gained exposure for Office 365. Measure, measure – The team continuously monitored and measured its impact with tools such as Sprinklr, RIO/Atlas, Meteor Solutions and Simply Measured. What do you think? What organizations and influencers can you team with to bring high-value content to your audience? Leave your questions and comments in the box below.